I don't have a job right now, and sometimes I feel a little unmotivated. Today, for instance, I'm at a friend's house pottering around. My wife is out of town, and I woke up late, after ten. I rolled around on the sofa pull-out mattress, grunting. At last I got up, sipped a little coffee. I opened a book by Anne Lamott and read a few pages. I wandered around the apartment, like a bear emerging from its hibernation cave. Finally I popped in a sci-fi movie and watched about thirty minutes of it. Maybe you're thinking: "Boy, this guy really needs to get a job. He's really wasting his time." And let me tell you something more. God had indicated he wanted me to spend today praying for a friend of mine. I've managed a couple short prayers so far, just an indistinct batch of sentences. It was about all I could manage. 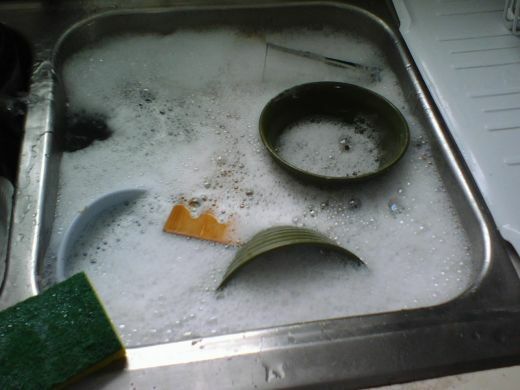 Then I decided to do the dishes. I collected them from where they were scattered around the house in crusty glory. I scrubbed them, feeling the warm water flow energetically over my hands. The pots banged as I wiped them out with a soapy washcloth and rinsed them in the sink. I tidied up books and clothing and papers around the house. Then I did stop and pray for my friend: for about five or eight minutes. And I read some more of the Anne Lamott book. Today while I potter around there are a lot of "voices" speaking to me. Here's what one of them is quietly saying: "You're a loser, you're a washed up guy, you're just pretending to be a writer. You're mind is grimy and your body is getting fat and lazy. You're stuck in the mud. You have all this time to do useful things but you just waste it. You're the equivalent of a leech on society." I'm just telling you what those voices have to say. But I don't pay much attention to those voices, most of the time, because I found a new Voice a few years ago. It was like dialing a radio tuner, but suddenly one day the channel started to come in. The Voice on that channel said, "You are special to me. You are one-of-a-kind. I gave my life for you and I did it gladly. I have such great plans for you, in this life and the next. You're the apple of my eye and I'm so proud of you. I'm proud that you took the time to come visit your friend. I'm happy you got to read this great book by Anne. I'm pleased that you did the dishes and tidied up the house. And I'm terribly proud that you are concerned about a friend of yours and want to spend the day praying for him. I'm pleased as punch, Daniel. Hang in there!" The Voice didn't seem to pay attention to a single one of my failures. I'm telling you, it's a pretty good radio station. That's why I feel a sense of peace as I loaf around this apartment. I know I'll get a job one of these days, but I've also learned recently that having a job is not what makes us human or even what gives true value to our life. I am thankful for this day, for the quietness of this room, for the clean dishes, for the few minutes I managed to pray. I think you can notice people who listen to the Old radio station too often. They look beat down, jumpy, on edge. That's cause the old radio station is never planning to say they are good enough. It's unreasonably critical. And if this New radio station is unreasonably supportive, I'm not going to complain. I probably wouldn't even be writing this entry if I couldn't hear that comforting, counseling Voice. I hope you can tune into this channel on your radio, too. thx for stating it so well! His approval. Music to my ears. I should definitely tune in more often.